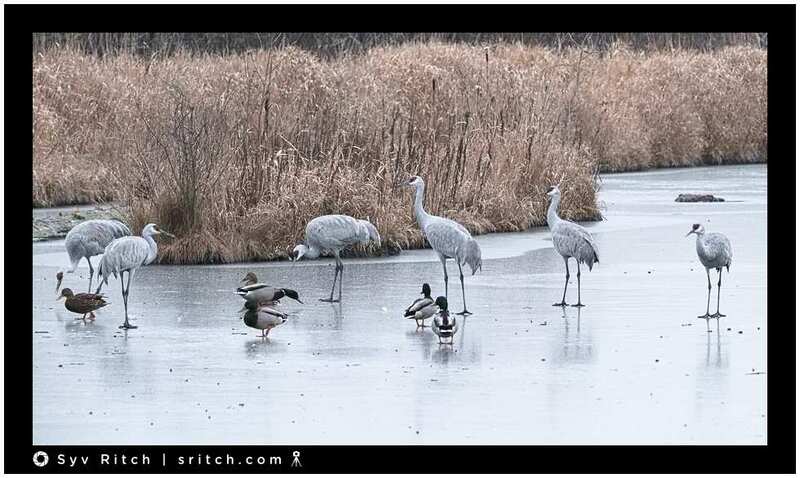 Normally, it’s not that cold, so we have Sandhill Cranes the whole year round. They stay on the west coast because normally, it’s a cool winter, not a freezing winter like the rest of the country. It’s actually nicer and warmer than most places in the US, so in the winter, many US Sandhill Cranes migrate to our region. How do we know that? Many of these Cranes have been banded. This year was very rough for the Sandhill Cranes. Not only it was cold but also food was scarce because of the weather. Sandhill cranes are mostly herbivores, meaning that eat grass/herbs. But they’ll eat corn, wheat, berries, insects, snails… Since food was so scarce for them that many people, including me, would put out seeds by the ponds, thanks to Costco 20lbs bird seed bags. Cranes are amazing birds, they often live to the ripe of age of 35.